ADB projects that gross domestic product growth in 2019 for the People's Republic of China will moderate to 6.3% from 6.4%. The growth outlook for 2018 remains unchanged at 6.6%. Image credit: ADB. 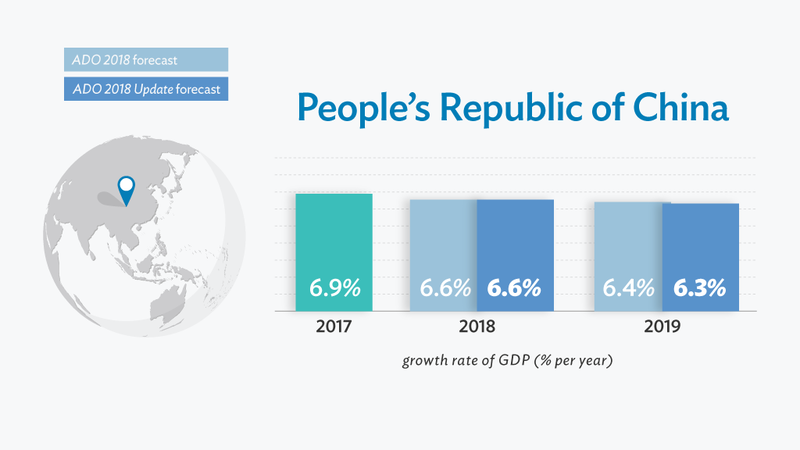 HONG KONG, CHINA (26 September 2018) — Slower demand growth and an unfavorable trade environment has dampened the People’s Republic of China’s (PRC) growth outlook for 2019, although supply-side reform, strong service sector growth, as well as monetary and fiscal support will keep the PRC’s economy on track, according to a new report by the Asian Development Bank (ADB). In an update of its flagship annual economic publication, Asian Development Outlook (ADO) 2018, ADB projects that gross domestic product (GDP) growth in 2019 for the world’s second largest economy will moderate to 6.3% from 6.4%. The growth outlook for 2018, meanwhile, remains unchanged at 6.6%, buoyed by strong economic performance in the first half of the year despite a slight moderation in the second quarter. The service sector contributed significantly to GDP growth, expanding 7.6% in the first half of 2018, though marginally down from 7.7% a year earlier. A robust service sector also kept the labor market healthy with the unemployment rate declining to 4.8% in June this year from 5.0% at the start of 2018, although the rate had returned to 5.0% by the end of August as the economic momentum weakened and new college graduates entered the job market. Growth in the industrial sector (including mining and manufacturing) slipped to 6.1% in the first half of 2018 from 6.4% a year earlier, cutting the sector’s contribution to GDP growth to 2.5 percentage points. This reflects the PRC government’s ongoing efforts to transition the economy away from industry and towards services. Agriculture, meanwhile, grew by 3.2% in the first six months of the year, contributing 0.2 percentage points to GDP growth. Consumption contributed 5.3 percentage points to GDP growth in the first half of 2018, up from 4.4 percentage points over the same period last year. Growth in infrastructure investment slowed sharply to 4.2% in the first 8 months of 2018 from 19.8% in 2017 as local governments streamlined infrastructure spending to contain local government debt. Net exports, meanwhile, subtracted 0.7 percentage points from growth in the first half of 2018. Consumption will continue driving the PRC economy’s growth for the rest of this year and the next, spurred by continued solid wage growth for skilled workers; resilient consumer confidence reinforced by lower personal income tax; and higher government spending on social priorities. Supported by a more expansionary fiscal policy, investment growth is seen to pick up through the rest of 2018 and remain solid through 2019, due partly to government plans to accelerate urban infrastructure spending and ease restrictions on public-private partnerships. Net exports, however, will hold back GDP growth for the rest of 2018 and 2019 as trade tensions with the US continue to intensify, coupled with a dimmer outlook on global trade and investment activities. With merchandise imports outgrowing exports, the current account surplus will likely narrow to the equivalent of 0.7% of GDP in 2018 and 0.2% in 2019. Consumer prices are projected to grow 2.2% in both 2018 and 2019 due to higher oil prices, resilient consumer demand, and a weaker local currency. Further escalation of the ongoing trade conflict between the US and the PRC could present downside risks, according to the report. It could deflate consumer and investor confidence, severely disrupt supply chains, impede technology transfer and foreign investment, and hit export-oriented industries in the PRC. While a more expansionary fiscal policy with higher infrastructure spending helps to sustain economic growth in the short run, the ADO update points out that over the longer term, it increases the financial burden on local governments, necessitating expedited reform of intergovernmental fiscal relations.